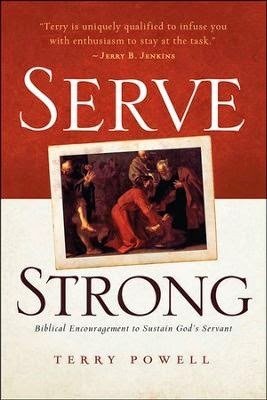 I accepted Serve Strong : Biblical Encouragement to Sustain God's Servants because I thought it sounded like a very encouraging read. And it is! For whatever reason, I had a hard time connecting to this read but that was entirely all about me and not about the book. My mind just couldn't focus on it and, the truth is, I feel rude for not being able to glean from it. It is a perfectly likable book. What I did read of it, it seemed full of solid, Biblical-based encouraged for the weary leader. Author Terry Powell encourages his readers by reminding them that it is natural to feel tired but offers them some solid meat to chew on for refreshment. Serve Strong is primarily geared towards pastors, elders and deacons. It does seem to focus more advice towards those positions but I would say that this book is useful for anyone in a position of service-filled leadership. Perhaps, especially, parents, who should never be discounted for the 24/7 role they play in raising up the next generation! "When you become a parent, expect that Satan will launch an attack on you. Expect a long drawn out fight. The family is a battleship, not a cruise ship. Wield every spiritual weapon at your disposal. But don't get discouraged or disillusioned that you throw down your weapons and go AWOL. When foes outnumber you, when victory seems elusive, when battle fatigue coaxes you to raise a white flag, remember that the firepower coming your way shows how integral you are to the war effort." In summary: don't base your opinion of this book on my lack of ability to finish it off. My mind was elsewhere and I didn't connect but what I saw and read were good things that could prove extremely useful and timely in the life of one who is struggling to keep on keeping on. Many thanks to Leafwood Publishers who sent a copy of this title my direction in order to facilitate this review. I received no additional compensation for this post and all opinions are 100% my own. I was reading The Complete Father Brown Stories alongside Annette but ultimately failed to complete the entire series. 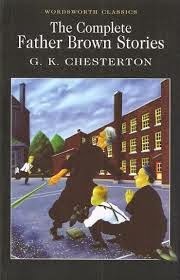 I read the first two books - The Innocence of Father Brown and The Wisdom of Father Brown. I enjoyed the mysteries, moderately. I thought Father Brown was an interesting character but I just didn't connect to them on the whole. I've been delaying writing up a review because I've never read Chesterton before and wanted to spend a little time researching and learning more about him in hopes of causing myself a deeper appreciation for this stories. But sometimes life gets in the way and - by the time you are reading this post - I will be returning from an overseas trip which prevented me from being able to do much research on this topic. I did enjoy Chesteron's wit and his attention to theological argument in solving any case. That makes these stories simply fascinating and some day I would like to go back and read the final books in the Father Brown series but I can't guarantee that that will be happening anytime soon. To alleviate my conscious a bit can we agree that they should be savored over a long period of time? Please? Anyone who wants to share a few facts about Chesterton in the comment section, please be my guest! Well, Carrie, I didn't finish Father Brown either. I think short stories are a bit too long for me...I need a breaking point where I can pause for 24 hours and not forget all the details of the plot. BUT I do like the stories. I will pick it up again!